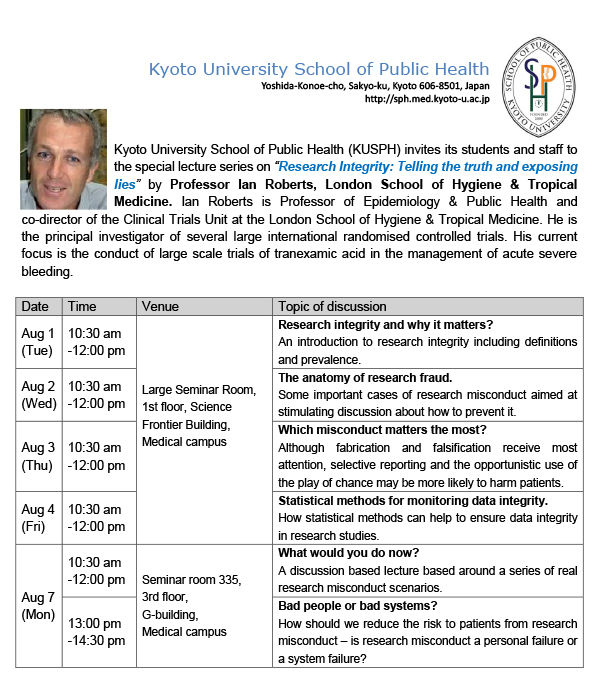 Kyoto University School of Public Health (KUSPH) organized a special lecture series on “Research Integrity: Telling the truth and exposing lies” by Professor Ian Roberts, London School of Hygiene & Tropical Medicine. Ian Roberts is Professor of Epidemiology& Public Health and co-director of the Clinical Trials Unit at the London School of Hygiene & Tropical Medicine. He is the principal investigator of several large international randomised controlled trials. His current focus is the conduct of large scale trials of tranexamic acid in the management of acute severe bleeding. More info can be found in the attachment.